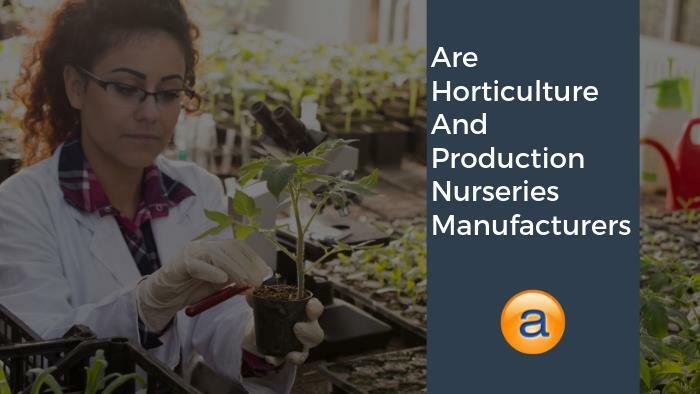 Are Horticulture and Production Nurseries Manufacturers? Do you run a horticultural business or plant production nursery? If not, you might be in an industry that supplies goods to people who do? Either way, you’re a producer of goods to sell within the horticultural industry. That makes you a manufacturer. Taking raw material such as seeds, plants and soil and turning them into goods and services is no different from a baker making a cake or a welder making a gate. Your goods are manufactured items and should be supported by business management software. Production nurseries manufacture plants that are sold to smaller retail nurseries, landscapers and developers. You need to use reliable tools to record all the business data you generate. Accentis Enterprise ERP software is a purpose-built business management solution to help you manage your processes and data to improve your bottom line. What can ERP Software do for Production Nurseries? It doesn’t matter what you are producing, because each item’s requirements can vary greatly. This variation could be down to different plant species, different seasons, the type of soil or fertilizer and even how much water is available. What software are you currently using to maintain a consistent record of plant growth? If you’re still using manual record sheets or Excel, you could be losing profits! Accentis Enterprise keeps a record of every possible requirement to ensure your propagation remains high with minimal loss of product. Can you track which plants have been disease free for their entire growth period? Can you easily run a report to see a percentage loss of viable product either through staff neglect or weather events? You can spend months, sometimes years, growing or manufacturing a product only to lose your profit because of circumstances you can’t view in a report. A staff member watering the incorrect field can have as much of an impact as any natural or environmental concerns. Maintaining a good workflow and allocating staff members to certain processes can help alleviate mistakes and improve results. Plants require nutrients to grow to their full potential. The bigger a plant grows, the more it’s needs change. A business is no different in this regard. What worked for your business when you had a small plot of tube stock may not work for the business when it has grown. No doubt you have made do with tools and processes to date, but how long can it continue? Multiple software products and manual procedures are like weeds you don’t want around your plants. Doing nothing or making the wrong changes can result in an even worse situation, which could be costing you money! Are these products and procedures keeping your business pot bound, restricting its growth and profit? As your manufacturing business grows, so too does its business requirements. This is part of a manufacturing growth cycle that businesses must go through either to become successful or wither away from neglect. If you are using all your time on manual processes or multiple data entry solutions, you’re not taking care of your business. What’s more important to you: a business that is healthy and running well; or a business stifled because of mismanagement? Think of your business as a plant. When was the last time you took notice of what it needed to grow? Accentis Enterprise ERP software is currently being used in several horticultural businesses and plant production nurseries. Our business management software will help your business by increasing information storage, sharing data seamlessly between departments and reporting on almost every aspect of your business. Accentis Enterprise can give your business the freedom it needs to grow! Accentis is a fully-integrated solution that offers manufacturing and production modules, but also Payroll and HR, Job Costing, Asset and Maintenance and complete Customer Management. Our software can also be used with Bunning’s EDI ordering requirements. Combined with a complete Supply Chain Management (SCM) facility and business accounts and financials, your business is well supported. We’re very familiar with the horticulture industry and are members of the NGIA, NGIQ and NGIV industry bodies. We sponsor and attend the Green Expo held on the Gold Coast in Queensland, which is a great place to meet with relevant industry businesses. You should come and meet us there! You might never have thought about your business needing management software, but our experience tells a different story. The benefits of Accentis Enterprise can apply to you as a manufacturer in the horticultural industry. If you grow plants, manufacture pots or provide tube-stock and soil treatments, what are you losing money on? Accentis Enterprise is a fully-integrated business management solution that can help SMEs across a wide range of industries. Are you ready to let your business grow?